It is time for Svenska Spel and every igaming company to get a mobile strategy! We access the Internet today with more devices than our PC. Last night I was about to watch Barcelona’s last game of the season and I had my iPad with me on my couch. I thought it would be fun to place a few bets on the match, so I went to svenskaspel.se to place my bets. 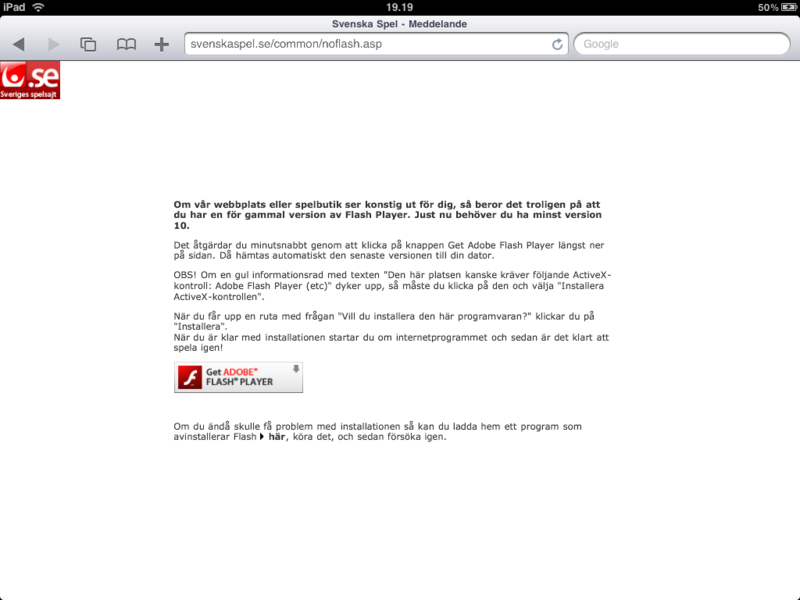 But it wasn’t possible for me to access Svenska Spel’s website since it is all in Flash. iPad and iPhones are two mobile devices who don’t have Flash. iPads aren’t available in Sweden yet but more than 500.000 iPhone have been sold here (9.3 million people live in Sweden). Over 45 million iPhones are sold worldwide, and 1 million iPads were sold the first month in the US. It is time for every igaming company to get a mobile strategy! Many igaming portals today have content and games built in Flash. It will probably take a while before we see games in HTML5 but you need to ask yourself if everything have to be in Flash.